We have two weeks remaining in the Annual Faith Formation Food Drive to benefit Backpack Pantry. One afternoon a week Backpack Pantry volunteers meet at SJV to fill bags for 48 families from Chautauqua Elementary who have difficulty feeding their school age children. Please support this wonderful SJV ministry, and by FEB 10 place your donated food items in the basket in the vestibule. You’ll find the poster with your shopping list right above the basket. Please remember, children carry their bags of food home, so single-serve, lightweight items are kindly requested. Thank you. 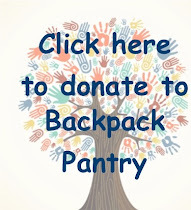 On February 20th at 2:00 the Backpack Pantry volunteers are inviting Faith Formation students to come and help them prepare the bags for the Backpack Pantry weekly drop off. As this generous service activity occurs during school hours, it is difficult for our students to take part. But Wed., Feb. 20th, is a school vacation day, so if your family is home that week, please consider coming to help. Do you or someone you know need emergency help with rent, food, or utilities? Call the St. Vincent de Paul hotline at 206.450.7577 to arrange a home visit. de emergencia con el alquiler, la comida o las utilidades? Llame al 206.450.7577 para arreglar una visita al hogar. The Vashon Ecumenical Book Group will discuss "The Sun Does Shine: How I Found Life and Freedom on Death Row," by Anthony Ray Hinton, from 4 to 5:30 p.m. Sunday, Feb 3 in the conference room at St. John Vianney Church, 16100 115th Ave. SW. Ann Scafe will facilitate. All are welcome. Hinton, charged and convicted in 1985 of two murders he did not commit, spent 27 years in an Alabama prison, three of them on Death Row. Ultimately released in 2015, he tells a powerful story of hope sustained through the darkest times. The weekend of February 9th and 10th as a parish we would like to acknowledge and congratulate you for your fidelity to the Sacrament of Marriage, and Father David will have a blessing ceremony for couples with significant wedding anniversaries this year (brand new marriages and decades old!). If you and your spouse will have a milestone anniversary this year and would like to be blessed and celebrated at Mass, please add your names, how many years you have been married, and the date and location of your wedding on the sign-up sheet in the vestibule. Envelopes are in the Bulletin for the Northwest Catholic Magazine Collection. As you know this collection is an important tool for evangelization at the request of our Archbishop. Please respond generously to sharing this free gift of Faith which goes to every registered household in Western Washington. Thank you. Catholic Advocacy Day is our opportunity to speak powerfully to our Washington State legislators on issues of life, economic justice, and housing. Other issues to be addressed may include education, access to health care, the environment, and restorative/criminal justice. Let’s join together on Thursday, February 7th, 2019 in Olympia to raise our voices to advocate for the common good. If you plan to attend this day, please register online by January 23rd at www.ipjc.org. Next weekend at SJV, please join Fr. David in welcoming Adria Briehl from Catholic Community Services. We will look forward to hearing about how we as Catholics will have a new opportunity for service here on Vashon, when CCS comes to Vashon and aids us in adding our numbers to those who are already serving Islanders in need. Also at the conclusion of Masses on February 2nd and 3rd, in honor of St. Blaise, bishop and martyr, Father will be blessing throats. Keep yourself sore throat free, and remember to remain after Mass for the Blessing service. Although on vacation, Fr. David has left the study guide for this weekend’s Gospel, and the Adult Gospel Study Class is invited to meet in the conference room to discuss Luke’s Gospel detailing the beginning of Jesus’ public ministry. Youth Faith Formation is in session this weekend, and for the next two Sundays until the Presidents’ Day Three-Day Weekend. Youth age 13-18 are invited to join our youth group, with youth mentors Collin Medeiros and Heidi Tosterud. We meet Thursdays from 6:30-8:30 pm at the church. Come for fun, faith sharing, and fellowship! If you are planning a Spring or Summer Baptism, Baptismal Preparation Classes will be held on March 4th and July 25th. At least one parent and one godparent must attend this class. Please contact the SJV Office (206-567-4149 or office@vashonsjv.org) in advance of the Preparation Class to let us know that you and your child’s godparent plan on attending. Baptism weekends will be April 27-28 and August 3-4. Are you letting Jesus proclaim the good news to you in your marriage? Sign up today to attend one of the next Worldwide Marriage Encounter weekends at the La Quinta Inn and Suites in Tacoma, WA, March 29-31,2019 Apply at www.mrwwme.org. For more information please contact Jeanpierre and Gay Charette at 253-582-0239. Early sign up is recommended. Sign up today. Is Your Marriage in Crisis? There Is Hope! When marriages are in crisis, couples often feel alone, frustrated and hopeless. But there is hope! Retrouvaille (pronounced retro-vi) has helped tens of thousands of troubled marriages. There is always hope, and you are not alone in your struggle. For confidential information about Retrouvaille, or to register for our upcoming weekend March 22-24, 2019, call 206-706-2608 or go to www.helpourmarriage.org. Are you interested in taking Communion to our parishioners who are sick or homebound? Your visit would include sharing the Gospel, as well as some SJV friendliness. In the new year Ellen Stewart will offer a training class for current and prospective EMCs who would like to be on the roster of the Homebound Ministry. This is a wonderful ministry that does not involve a large time commitment, so please consider becoming an EMC for the Homebound. The date of the class will appear soon in the Bulletin. If you need to arrange for someone to receive the Eucharist at home, please call the office at 206-567-4149. © 2007-2013 St. John Mary Vianney Catholic Church Vashon Island. Watermark theme. Powered by Blogger.